This model has been discontinued. 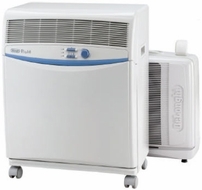 As an alternative, we recommend the DeLonghi PAC700T Pinguino Portable Air Conditioner. NO DRIP TECHNOLOGY. With this exclusive process, Pinguino uses condensation and collected moisture to help cool the air. Excess vapor is then discharged through the exhaust hose. ENERGY-EFFICIENT ADJUSTABLE THERMOSTAT allows you to customize your cooling needs. EASY-TO-USE CONTROL PANEL incorporates an on/off switch with light and two-speed fan. WINDOW / DOOR BRACKET for easy installation and exhausting of hot air. And the easy-to-connect hose between the indoor and outdoor unit allows for fast installation. 24-HOUR PROGRAMMABLE TIMER WITH CLOCK FUNCTION includes a convenient by-pass function. ENERGY SAVING. Because a portable air conditioner can be operated independently of central systems, it is easier to target cooling specifically where you want it. Cooling with a central air system usually creates wide fluctuations in temperature and causes a cool / warm effect as the thermostat cycles on and off. EASILY PORTABLE thanks to its durable indoor and outdoor castor wheels and side-carry handles. Also includes an extra-large professional castor kit. QUIET OPERATION. Pinguino performs quietly thanks to the high efficiency compressor and components. BUILT-IN DEHUMDIFIER removes up to 88.77 pints of moisture a day. AUTOMATIC SAFETY DEVICE to protect the compressor when switched on immediately after being switched off.